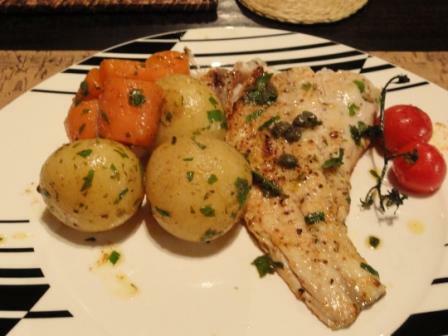 Kabeljou (Kob) is a locally caught fish that is quite gamey and can take on a lot of strong flavours. I wanted to make this Caper Lemon Butter Sauce to accompany fish for some time and I can really recommend it for any white firm flesh fish. Lemons should be a staple ingredient in any home in my opinion. No step by step recipe is really needed for this Kabeljou with Caper Lemon Butter Sauce. As soon as you have taken the fish out the pan add a generous knob of butter to the pan. Add 15mls drained capers and a generous squeeze of lemon juice. I added some chopped flat leaf parsley for colour. Drizzle over the fish and serve.